With all the environmental issues facing the planet these days, it’s not often you hear about real viable solutions to any of the problems that can be fully taken advantage of right now. But the Science Barge project (started in 2006) is one of those viable solutions. By taking common technology, and combining them together, the Science Barge project is showing that there’s at least one answer to the planets problems that can be implemented today. Without waiting decades for the technology to be developed and perfected first. 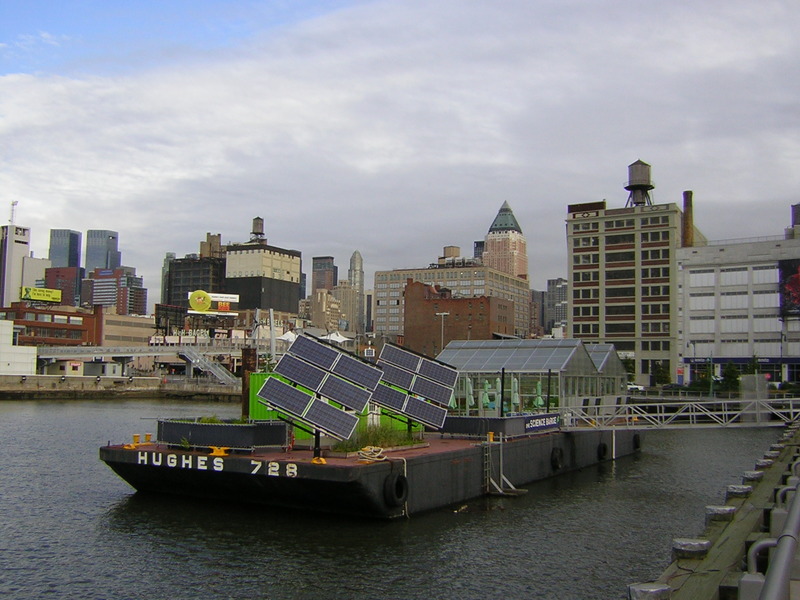 The Science Barge is a floating, sustainable urban farm project, that’s owned by Groundwork Hudson Valley in NY. There funded by federal, corporate, and foundation support as well as receiving individual donations. The Barge may be a small scale project, but the goal is to help educate and show future farmers that a self sustaining farm can be done on a large scale. By not only serving as a model for future farms, but it’s also serving as an ongoing educational tool to students, collages and the general public. Another goal is to get people to think outside the box, by simply showing them that growing food can be done in lots more places then were conventionally thought to be unusable for crops, and food production. Can you imagine crops growing on rooftops, buildings, floating on lakes or oceans, suspended above parking lots and highways, on top of sports stadiums and Schools. The Science Barge program is a 135 foot long flat bottom boat based in Yonkers NY. that takes hydroponics and aquaponics, as well as being green to the next level. By using solar, wind, and bio-fuels (with no carbon emissions) to fully power the project. Water storage tanks hold rainwater from a rainwater catchment system, as well as a RO system (Reverse Osmosis) that purifies river water to irrigate the crops. The used water is also recycled so there is no waste-water run-off going back into the environment. The water demand for irrigating all the plants on the barge is about 75 to 150 gallons per day. that’s less than 1/4 the demand for the same amount of field grown plants. The fruits and vegetables grown on the Science Barge also require seven times less space to grow than traditional field grown crops. They get all of the electricity they need from wind, solar and bio-fuels. They have five internally regulated wind turbines (with a total 2.0 kW of power), two passive solar trackers, including solar charge controller and auto-transformer. These solar panels track the suns path for maximum efficiency (with a total 2.45 kW of power). All of this electricity is stored in a bank of battery’s on-board the barge. The battery bank is capable of storing a two day reserve of needed electricity. But well you just never know, so they also have a generator that has been converted to run on used vegetables oil (bio-fuel), just in case. The barges daily power demand is about 25 kWh. Large farming operations that don’t use all the electricity generated from the solar and wind generators, can also sell the excess electricity to the electricity company’s for an added source of income. Along with regular hydroponics, they are also utilizing the technology of aquaponics on the Science Barge. Aquaponics is a little bit different than traditional hydroponics, it’s a process where the nutrients solution is created in a controlled living environment of living fish, water-plants, and microorganisms that break down the organic material (fish waste etc. ), into the raw elements the plants can then absorb from the roots. Among other things, the aquaponic system on the science barge is home to crayfish, goldfish, catfish, and is able to grow editable food. The Science Barge also contains a small man made wetland area, that’s located underneath the solar panels that is used to recycle the used water from the hydroponic, and aquaponic systems. But is it really all that efficient? 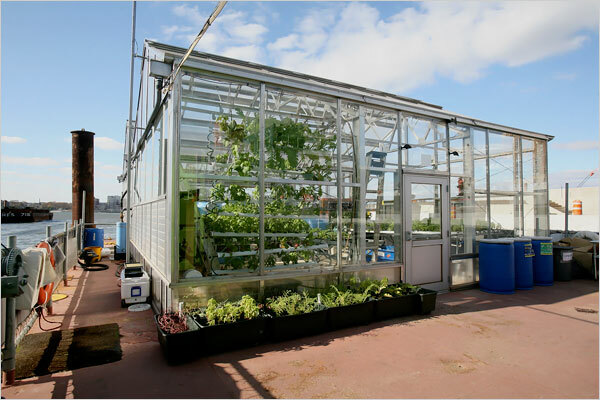 The Science Barge is able to grow 2000 pounds of fruits and vegetables in an area about the size of a single bedroom apartment, all in a single growing season. Unlike field grown plants where there’s only one growing season a year, because you control the plants environment when growing hydroponically, you can have anywhere from 4 to 8 growing seasons in a single year (depending on crop/plant). There’s no off season in hydroponics, plants are grown and when their done their immediately replaced with new plants, all year long. So along with being able to grow 7 times more produce in the same amount of space, and using less than 1/4 of the water to do it, then multiplied by many more seasons per year in the same space. Well I’ll let you do the math. And on top of all that, it’s completely environmentally sustainable too. The only downside would be the higher start-up costs, mainly from building the greenhouses, wind turbines, solar panels, and battery bank to store the energy. That’s the main stumbling block, but due to the much higher yields will quickly more than pay for itself. Especially when you factor in all the savings from not needing all the very expensive heavy equipment needed to plow and condition the soil, spray pesticides, as well as harvest traditionally grown field crops. From my point of view, I don’t see how we can afford to continue to grow crops the traditional way anymore. Science Barge technical description pdf. Is the Science Barge Sustainable?